What Is Cancer Prehab and How Does It Help? What is cancer prehab and how could it help you fight cancer? A growing number of people preparing to undergo cancer treatment are choosing to take part in “prehab” before treatment begins. But what is prehab and what benefits can it offer? The term was first used to describe specially designed, structured exercise programs for people who were scheduled for orthopedic joint replacement or heart surgery. 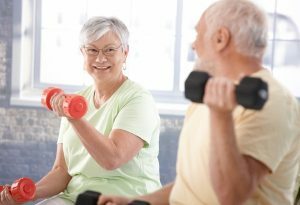 In these programs, participants would take part in regular supervised exercise that was designed to improve muscle strength and cardiovascular health. A growing number of oncologists are now recommending a similar approach for patients before they begin cancer treatment. The goal is to help patients build their endurance, cardiorespiratory health and strength to prepare their bodies for the stress of radiation, surgery and chemotherapy. Some early research suggests that structured prehab may help people tolerate cancer treatment better and get back to their normal activities more quickly. In a randomized, controlled study led by researchers at McGill University in Montreal, 77 people with colorectal cancer were divided into two groups. Half of the people went through a four-week program of exercise, relaxation techniques and nutritional counselling before surgery. The other group participated in the same program for eight weeks after surgery. Eight weeks after surgery, the patients who did prehab were able to walk an average of 23.7 meters farther than they could before prehab. In contrast, those who did post-surgical rehab were able to walk 21.8 meters less than they could before surgery and completing the rehab program. Prehab can be tailored to each patient’s physical and psychological needs and may be especially beneficial for people who are elderly, frail or in poor physical condition. For example, if a person has been diagnosed with head and neck cancer, working with a therapist on swallowing exercises before treatment may help him or her swallow better and be able to eat more throughout treatment. That in turn can help prevent weight loss and improve energy and strength, making treatment better tolerated. If a women is diagnosed with breast cancer and scheduled for mastectomy, prehab could focus on exercises to strengthen the upper body and improve range of motion, which may help reduce pain after surgery and lower the risk of complications like “frozen shoulder”. In addition to physical exercise, prehab may also include psychological counselling and support, teaching of stress management techniques, nutrition counselling and lifestyle modifications like smoking cessation and weight management. Another benefit of prehab is that it helps patients be more actively engaged in their care and recovery, which can have significant psychological benefits. Depending on your diagnosis, you may be able to take part in prehab during the period between diagnosis and the start of active treatment or while you’re seeking a second opinion on your diagnosis and recommended treatment plan. Discuss whether prehab is appropriate for you with your oncologist. If you’re interested in finding a prehab program, a personal health advisor can connect you with programs and experienced practitioners in your area.